Mentoring in IBD is an innovative and successful educational program for Canadian gastroenterologists that now includes an annual national meeting, regional satellites in both official languages, a website, an educational newsletter series, and regular electronic communications answering key clinical questions with new research. This issue is based on the presentation made by contributing editor, Dr Khursheed Jeejeebhoy, at the annual national meeting, Mentoring in IBD XVI: The Master Class, held November 6, 2015 in Toronto, Ontario. Vitamin D is a critically essential nutrient for all people, irrespective of the presence of inflammatory bowel disease (IBD). All tissues, not just bone, require vitamin D. There are five forms of vitamin D, and vitamin D2 and D3 are the forms with major biologic importance (Figure 1). Vitamin D2, which is also known as ergocalciferol, is derived from diet. (1) Vitamin D3, also called cholecalciferol, is derived both from diet and from the action of sunlight on the skin converting 7-dehydrocholesterol, or provitamin D3, to vitamin D3. The majority of vitamin D in the body is produced by exposure to sunlight. 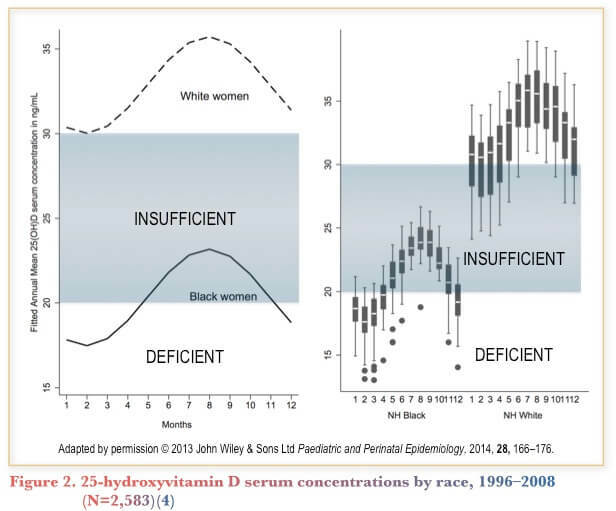 In the liver, vitamin D2 and D3 are converted to 25-hydroxyvitamin D, the circulating form of vitamin D and the form measured to determine sufficiency or deficiency (Figure 1). 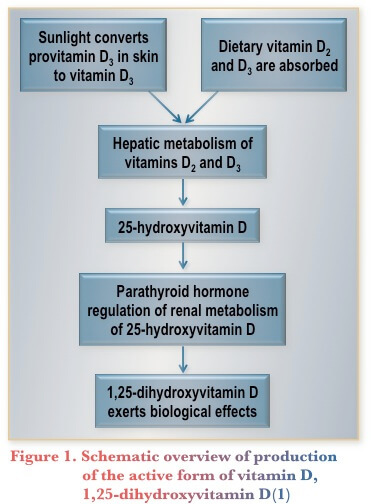 (1) Parathyroid hormone regulates the renal conversion of 25-hydroxyvitamin D into the active form of vitamin D, 1,25-dihydroxyvitamin D. Through a negative feedback loop, circulating 1,25-dihydroxyvitamin D levels suppress parathyroid hormone levels. Vitamin D sufficiency is considered to be the level of 25-hydroxyvitamin D providing a parathyroid hormone nadir and maximal intestinal transport of calcium. Elevated parathyroid hormone levels remove calcium from bone, and osteoporosis is related to chronic vitamin D deficiency. Using these criteria, deficiency is defined as a 25-hydroxyvitamin D level <50 nmol/L, insufficiency as 52-72 nmol/L, and sufficiency as >75 nmol/L. (2) Toxic levels are >300 nmol/L. Vitamin D deficiency is common in patients with IBD and is exacerbated by inflammation. As a result, severe vitamin D deficiency can occur in patients with IBD. An uncontrolled Canadian study (N=242) determined the frequency of low 25-hydroxyvitamin D levels and associated alterations in bone mineral density in a cohort of adults with Crohn’s disease (CD). (5) The study found 52 patients (22%) were deficient in Vitamin D, with 25-hydroxyvitamin D levels <40 nmol/L. Mean bone mineral density did not differ from that in patients with sufficient 25-hydroxyvitamin D levels, although alkaline phosphatase and parathyroid hormone levels were higher in patients with low 25-hydroxyvitamin levels than in those with normal 25-hydroxyvitamin levels. In males, low red blood cell (RBC) folate was associated with low 25-hydroxyvitamin levels, whereas in females, smoking, low RBC folate, and low serum iron were associated with low 25-hydroxyvitamin levels. 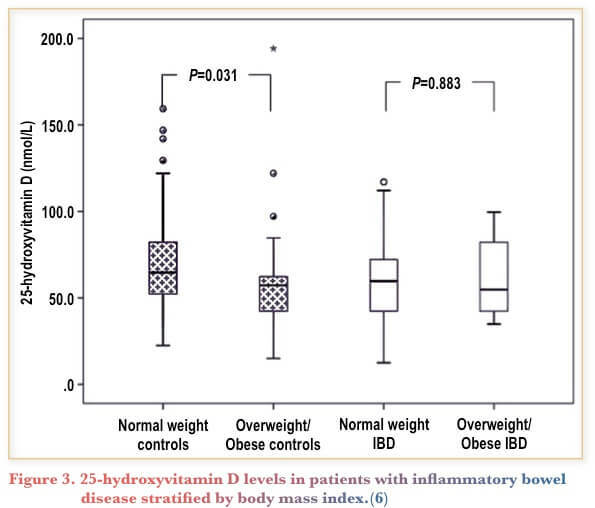 A retrospective case-controlled study of pediatric patients with IBD (n=58) and healthy controls (n=116) stratified by body mass index evaluated 25-hydroxyvitamin levels. (6) Overweight and obese controls had significantly lower 25-hydroxyvitamin levels than normal-weight controls (P = 0.031). The study found no difference in the overall levels of vitamin D between patients with IBD and controls, but patients with IBD, who had an elevated erythrocyte sedimentation rate (ESR), had significantly lower levels than both patients with IBD and normal ESR (P = 0.025) and controls (P= 0.045) (Figure 3). The majority of patients were deficient in vitamin D.
A retrospective cohort study of patients with IBD (N=504) assessed disease activity, health-related quality of life, and the prevalence and predictors of vitamin D deficiency. (7) Deficiency was present in 49.8% of patients, and severe deficiency in 10.9%. Predictors of deficiency were older age (P=.004) and older age at diagnosis (P=.03). Insufficiency or deficiency of vitamin D was present in a majority of patients and was associated with lower health-related quality of life in patients with CD and in those with ulcerative colitis (UC) and with increased disease activity in CD. The Manitoba IBD Cohort Study assessed bone mineral density and the role of vitamin D metabolism in a subgroup of patients (n=101) with newly diagnosed IBD. (8) The study measured bone mineral density and 25-hydroxyvitamin D levels at baseline and 2.3 ± -0.3 years later. Only 22 patients (21.8%) had optimal 25-hydroxyvitamin D levels (≥75 nmol/L). 25-hydroxyvitamin D levels positively correlated with baseline bone mineral density (P<.05) and with increases in total body bone mineral density with treatment (P<.05). As a result, early optimization of vitamin D may be relevant in preventing IBD-related bone disease. Risk factors for vitamin D deficiency that have been identified in patients with IBD include decreased exposure to sunlight, increased disease duration, smoking, and genetics. Increasing evidence supports the role of vitamin D as an immunomodulator that can reduce inflammation and induce antibacterial activity in IBD. 1,25-dihydroxyvitamin D acts on CD4 cells to promote Th2 cell development and on dendritic cells to reduce Th1 cells. (1) Also, the induction of anti-inflammatory cytokines, interleukin (IL)-4, IL-5, and IL-10, suppresses inflammation. Normalization of vitamin D levels is associated with a reduction in the risk of relapse and IBD-related surgery and an improvement in quality of life. Additional research needs to determine optimal 25-hydroxyvitamin D levels to achieve beneficial immune effects and to elucidate the role of vitamin D in achieving and maintaining response and remission. A prospective cohort study of patients with IBD (N=220) assessed the effect of 25-hydroxyvitamin D levels and vitamin D supplementation on health-related quality of life. (9) Vitamin D supplementation was used in a subgroup of patients (n=26) for >3 months. 25-hydroxyvitamin D levels and quality of life were assessed during the summer and autumn period and during the winter and spring period. Mean 25-hydroxyvitamin D levels and correlation with CD activity were evaluated separately for each time period. The effect of vitamin D supplementation on winter 25-hydroxyvitamin D levels, change in 25-hydroxyvitamin D levels from summer to winter, and winter quality of life were analyzed. During the summer and autumn period, 28% of patients were deficient in vitamin D (25-hydroxyvitamin D levels <20 ng/mL), and during the winter and spring period, 42% of patients were vitamin D deficient. In the winter and spring period, the quality of life score and 25-hydroxyvitamin D level were significantly correlated in patients with UC (P=.02). A trend towards significance (P=.06) was seen in patients with CD. During this time period, a significantly lower quality-of-life score was recorded in vitamin D-insufficient patients (levels <30 ng/mL) with CD (P=.04) and in those with UC (P=.04). At both time periods and for patients with CD or UC, health-related quality of life was highest for patients with 25-hydroxyvitamin D levels of 50 to 59 ng/mL. Vitamin D supplementation (mean 800 IU/day) had no influence on 25-hydroxyvitamin D levels or quality-of-life scores. A 6-week, randomized, controlled trial of vitamin D supplementation in children and adolescents with IBD (N=61) and vitamin D deficiency (25-hydroxyvitamin D levels <20 ng/mL) was performed to compare the efficacy and safety of three different oral regimens: vitamin D2, 2000 IU per day, vitamin D3, 2000 IU per day, or vitamin D2, 50,000 IU per week. (11) All patients received a calcium supplement. Vitamin D3, 2000 IU per day, was significantly more effective than vitamin D2, 2000 IU per day, in increasing 25-hydroxyvitamin D levels (P=.03). Vitamin D3, 50,000 IU per week was also significantly more effective than vitamin D2, 2000 IU per day (P=.0004). Only the regimen providing 50,000 IU per week normalized 25-hydroxyvitamin D levels (mean ~60 nmol/L). All regimens were well tolerated. Patients with malabsorption due to resection may require supplementation levels ranging from 50,000 IU weekly to 50,000 IU on alternate days to normalize 25-hydroxyvitamin D levels. Deficiency of vitamin D is common among patients with IBD. It is important to measure 25-hydroxyvitamin D levels in this population, to treat vitamin D-deficient patients with appropriate doses of vitamin D, to monitor changes in 25-hydroxyvitamin D levels with supplementation, and to provide regular maintenance supplementation. It is also important to remember that vitamin D is nontoxic and high supplementation levels are often required. In patients with IBD, the benefits of vitamin D supplementation include improved bone health, reduced inflammation, and improved quality of life. Reich KM, Fedorak RN, Madsen K, et al. Vitamin D improves inflammatory disease outcomes: basic science and clinical review. World J Gastroenterol. 2014;20;4934–47. Holick MF. Vitamin D deficiency. New Engl J Med. 2007;357:266–81. Pietras SM, Obayan BK, Cai MH, et al. Vitamin D2 treatment for vitamin D deficiency and insufficiency for up to 6 years. Arch Intern Med. 2009;169:1806–08. Luque-Fernandez MA, Gelaye B, VanderWeele T, et al. Seasonal variation of 25-hydroxyvitamin D among non-Hispanic black and white pregnant women from three US pregnancy cohorts. Paediatr Perinat Epidemiol. 2014;28(2):166–76. Siffledeen JS, Siminoski, Steinhart H, et al. The frequency of vitamin D deficiency in adults with Crohn’s disease. Can J Gastroenterol. 2003;17:473–78. Veit LE, Maranda L, Fong J, et al. The vitamin D status in inflammatory bowel disease. PLoS One. 2014;9(7):e101583. Ulitsky A, Ananthakrishnan AN, Naik A, et al. Vitamin D deficiency in patients with inflammatory bowel disease: association with disease activity and quality of life. J Parenter Enteral Nutr. 2011;35:308–16. Leslie WD, Miller N, Rogala L, et al. Vitamin D status and bone density in recently diagnosed inflammatory bowel disease: the Manitoba IBD Cohort Study. Am J Gastroenterol. 2008;103:1451–9. Hlavaty T, Krajcovicova A, Koller T, et al. Higher vitamin D serum concentration increases health related quality of life in patients with inflammatory bowel diseases. World J Gastroenterol. 2014;20:15787–96. Holick MF, Binkley NC, Bischoff-Ferrari HA, et al. Evaluation, prevention and treatment of vitamin D deficiency. An endocrine society clinical practice guideline. J Clin Endocrinology Metab. 2011;96:1911–30. Pappa HM, Mitchell PD, Jiang H, et al. Treatment of vitamin D insufficiency in children and adolescents with inflammatory bowel disease: a randomized clinical trial comparing three regimens. J Clin Endocrinol Metab. 2012;97:2134–42.